CONVENIENTLY MAKE A PAYMENT ONLINE. ​If you wish to use a credit card to make a deposit or payment, please press ‘ Deposit or Payment." 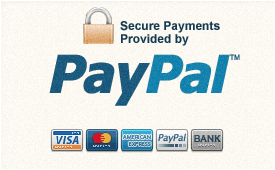 You will be taken to PayPal where you can choose from a number of payment options. Your sensitive information is protected by PayPal’s world-class security encryption. WHEN MAKING AN ON-LINE PAYMENT, PLEASE INCLUDE THE 3% TRANSACTION FEE WITH THE TOTAL PAID.